At this time of year, great fresh fruit and vegetables start appearing again in the grocery store at reasonable prices. Browse the produce department for inspiration to celebrate the return of the spring sunshine with this easy, fresh veggie-rich abundance bowl. 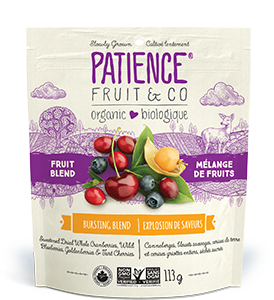 The secret touch that makes all the difference in this recipe is our fabulous dried whole fruit blend, bursting with cranberries, wild blueberries and tart cherries. A touch of sweetness (done the healthy way) makes your abundance bowl simply magical. Mix all the marinade ingredients in a bowl. Add tofu and marinate for 15 minutes at room temperature. Set aside. Place nutritional yeast in another bowl. Set aside. Meanwhile, cut carrot into julienne strips and chop remaining vegetables finely. Set aside. Remove tofu from marinade, keeping marinade to use for dressing. Place tofu cubes in nutritional yeast and coat all surfaces well. Heat 15 ml (1 tablespoon) vegetable oil in a non-stick pan. Cook tofu cubes until all surfaces are browned, about 4 to 6 minutes. Add more oil as needed. Set tofu cubes aside. Add tahini and yogurt to remaining marinade. Stir well. Divide baby spinach leaves and vegetables among bowls. Top with tofu cubes and drizzle with dressing. Sprinkle with green onions if desired. Note: Nutritional yeast is not the same thing as the yeast that’s used in baked goods. It’s an inactive yeast made from microscopic fungi, used to add flavour to dishes. The taste is somewhat like parmesan cheese or hazelnuts. It’s inexpensive and can be found in the health foods aisle. The flavours in our exclusive blend of berries complement each other so well, and pop so vibrantly in your mouth, you won’t be able to resist them. In this unique mix, goldenberries add a light touch of pleasant tartness.